My god - how exciting is this title? Very. 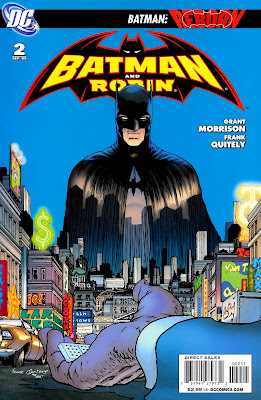 From the grotesque carny villains, to the pressures that the New Batman faces, from his precocious and fiery partner Robin, from the expectations of living up to his illustrious predecessor. Most of all, the pressure to fight crime, to do the right thing - all this has to be surmounted, and conquered, and all on the fly. The City of Gotham never sleeps, so the learning is very much on the job. The art is exquisite, with Quitely giving the action a fluidity and dynamism that, for me, puts him at the top of the pile. He is perfect for this title, a title with so much at stake, so much history. Also, Grant Morrison keeps the action tight, the dialogue sharp, and the story is fantastic. Too many highlights, it's all good. Absolutley wonderful. Verdict. You kidding? This is AMAZING. We can move on from Batman RIP (and the confusing letdown that it was) because it gave birth to this, and this is magnificent. 9.75 out of 10. Yes, I love it.